Product prices and availability are accurate as of 2019-04-22 05:20:25 UTC and are subject to change. Any price and availability information displayed on http://www.amazon.com/ at the time of purchase will apply to the purchase of this product. Colorful, easy-to-handle carpet squares are a great way to teach children colors. 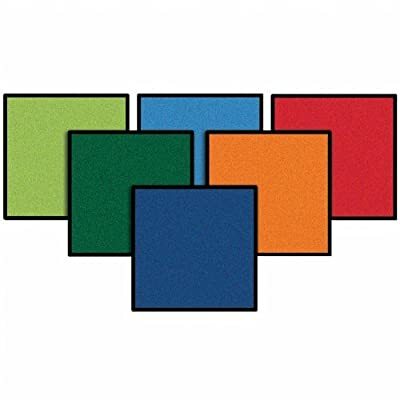 These 16" x 16" carpet squares are durably designed to provide a lifetime of learning and fun. The KIDS Value Plus line sports upgraded KIDply(R) backing and edge yarn for long-lasting carpets that stay looking great. Set of 24 in each set. Made in the USA. Features: 5 Year Abrasive Wear Warranty, KIDply(R) Backing, 100% North American Made, No-Fault Edge Warranty, Soil Resistant, and Passes CPSC FF1-70, Standard for the Surface Flammability of Carpets and Rugs.